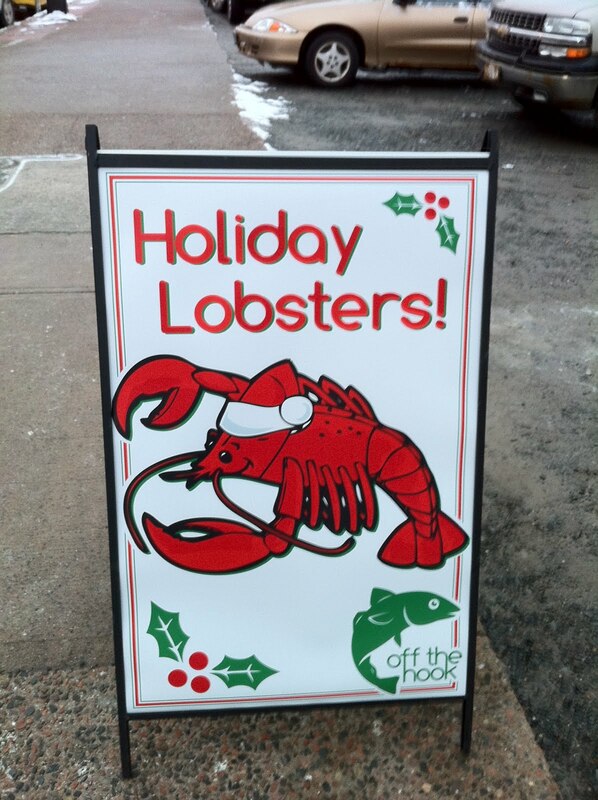 A little birdie told me about Off the Hook and fresh lobster at the Historic Brewery Farmers Market. If you are in Halifax and missed out today, they'll be back on Dec 23rd & 30th. 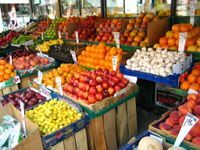 ...Community Supported Fisheries (CSFs) are modelled after “Community Supported Agriculture” (CSA) enterprises, which work to connect consumers to locally and sustainably grown, fairly traded foods. Social enterprises like CSFs help make sure that independent, small-scale fishing families can continue to pursue their livelihoods in an industry rapidly becoming dominated by large-scale, corporate players." 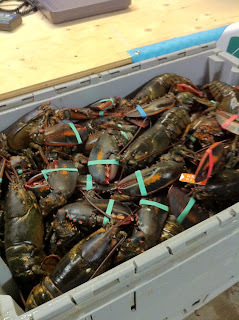 I love supporting local farmers and fishermen when I can, so when I heard about the lobsters... 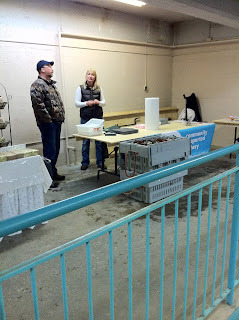 I was there bright and early and met Captain Chris Hudson and (I'm guessing) his lovely wife. Just check out the haul- too bad I didn't take a video because they were all waving at me and I can only assume they were thinking "Pick Me! Pick Me! Then again, perhaps they were saying "Pick Him! Pick Her!" 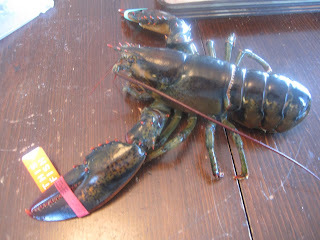 My catch of the day...four gorgeous 1 1/2 lb lobsters for dinner tonight. Well, my Honey, my daughter & son-in-law will love them. The boys will enjoy their chicken fingers. ...check out the tag on the claw. 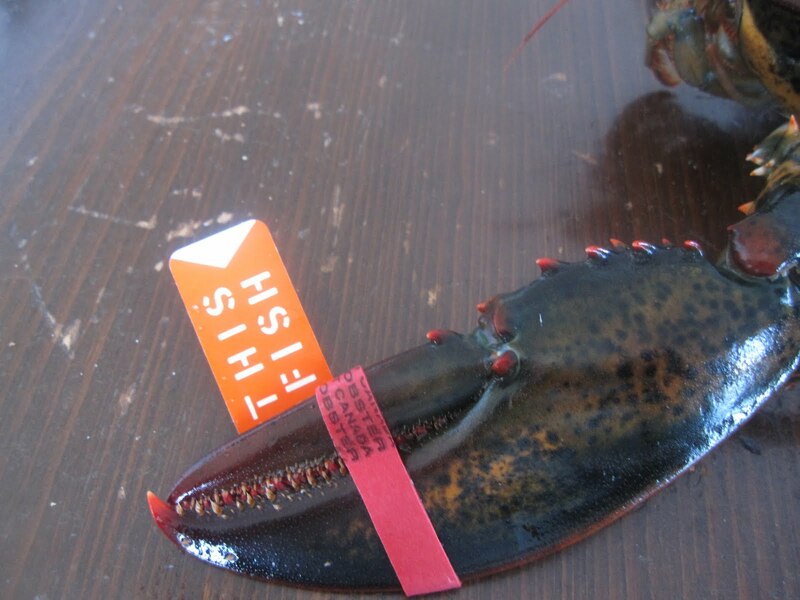 Each lobster has an ID number and you can trace it to when & where it was caught, plus who caught it. What a cool hi tech way to actually know how fresh your lobster is. Check out... This Fish. This one... and his three friends were caught yesterday in the Bay of Fundy, by Captain Chris Hudson; his vessel - the Fundy Viper II; port - Victoria Beach NS. It's a wonderful way to really understand when & where our food comes from. A couple of months ago I reviewed The Ocean Wise Cookbook, that made me more aware of how little I knew about the fish I was buying. It got me checking out labels at supermarkets and asking fishmongers pointed questions about the provenance of my potential purchase... and still leaving me frustrated and uninformed. But not today. 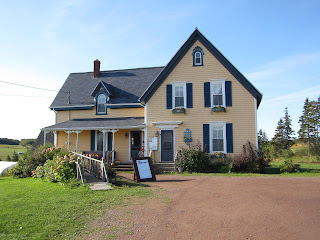 Today I have the most beautiful, fresh lobsters, caught yesterday in the Bay of Fundy, purchased this morning before 8am, and I'm going to do the simplest thing with them for dinner. Steamed or boiled in sea salted water (1 tbsp salt for every litre/quart of water) for 12 minutes for 1lb/500g lobster and an additional minute for every 1/4 lb/125 g. My 1 1/2 lb/750g lobsters should only take 14-15 minutes - for boiling and 20 minutes for steaming (1" of salted water in a huge pot). 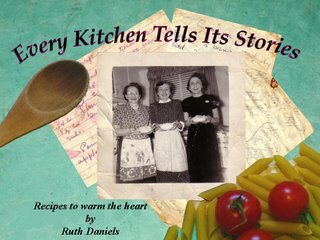 Tip from Anita Stewart's Canada is to plunge the cooked lobster in a sink of ice water for 30 seconds to to prevent the meat from sticking to the shell. 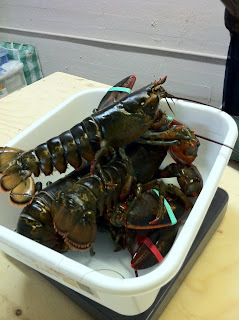 I'll be serving them with melted garlic butter and lemon wedges. A side salad is enough for me, but apparently my daughter needs some carbs, so perhaps some steamed rice. 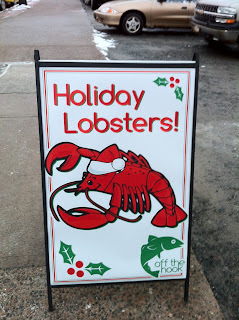 Funnily enough we have a Hooked on Seafood on the highway. They have a woman there who fishes sustainably and who is quite passionate.